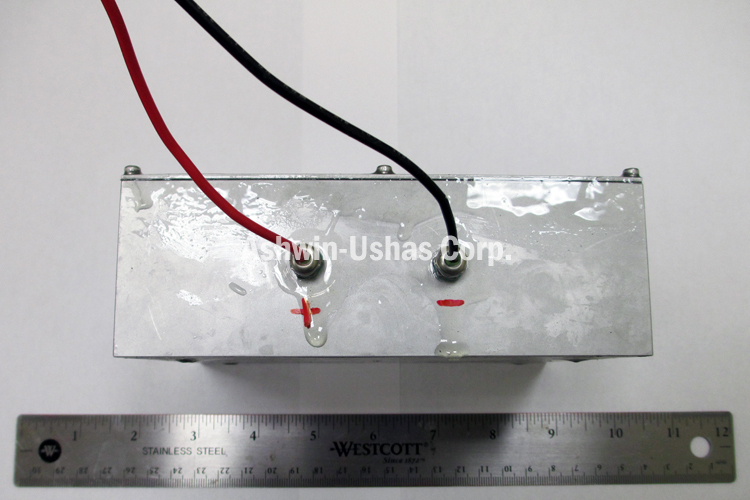 Secondary and Primary Li-ion Batteries | Cutting Edge Technology | Ashwin-Ushas Corp. | Ashwin-Ushas Corp. Unique secondary (rechargeable) and primary Li ion batteries with very wide operating temperature (-20°C to +55°C), 20-year shelf life, no self-discharge current during storage, high power (93 Wh/kg for fully packaged battery), voltages ranging from 3.7 V to 28 V, and resistance to radiation and acceleration (tens of g‘s). Based on specially developed ionic liquid electrolytes. Use unique electrolyte based on patented ionic liquids. Wide operating temperature, (-20°C to +55°C). Non-flammable: Ionic liquid based electrolyte also yields non-flammability. 20-year shelf life: Due to unique battery design and unique initial charging method, which together eliminate self-discharge entirely. Shelf-stored battery is activated within a minute. Battery voltages from 3.7 V to 28 V.
Specific energy (power) at least 93 Wh/kg, at all temperatures within operating temperature range. Designed to endure flash X-Ray, low-dose X-ray and gamma-ray radiation in near-space/reentry/-low earth orbit (LEO), acceleration of tens of g‘s. 20-year shelf life: Due to unique battery design and unique initial charging method, which together eliminate self-discharge. Storage temperature between -20°C and +50°C. Shelf-stored battery is activated within a minute. Originally developed for the US Air Force to replace legacy Ag-Zn batteries used in the US’s ICBMs. Technology is currently under further development, with extended environmental durability, radiation-exposure and lifetime testing planned or under way. For inquiries and more information, please Contact Us. World leader in variable emittance and related IR-electrochromic materials. World leader in IR-electrochromic materials and the related variable emittance materials. Highly innovative, green technology for localized, point-of-service medical waste remediation. Innovative technology actively pushes out water vapor from inside garment. Originally developed for use in near-space or LEO. Rapid, ppb- or sub-ppb-level detection, good discrimination of interferents, portability, Android cell phone interface. Switch in less than 2 seconds. Automatically adjust to ambient light. Work indoors and in cars. Li battery rarely needs recharging. Available with prescription inserts. Very wide current range. Electrochemical Impedance Spectroscopy (EIS) and AC Voltammetry capabilities. Coming soon. Developer of advanced technologies in the defense, aerospace, space, materials, and environmental fields.